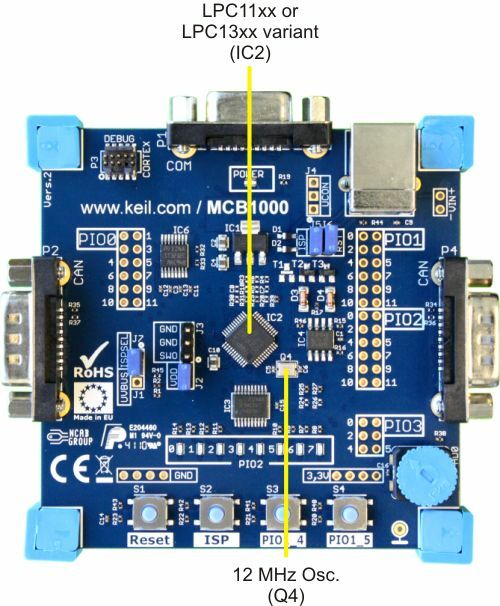 The NXP LPC1114FBD48/302, LPC11C14FB48/301, LPC11U14, LPC1313FBD48, or LPC1343FBD48 microcontroller at (IC2) provided with the MCB1000 board is a high-end Cortex-M device with advanced ADC and Serial I/O capabilities. These devices all include a Serial Wire Debug interface for downloading and debugging. They do not support a JTAG interface. A 12.0 MHz crystal (Q4) provides the clock signal for the CPU.